Is there a better alternative to Berkeley UPC? Is Berkeley UPC really the best app in Compilers category? Will Berkeley UPC work good on macOS 10.13.4? Berkeley UPC is an extension of the C programming language designed for high performance computing on large-scale parallel machines. Version 2.18.2: Release notes were unavailable when this listing was updated. Downloads for other OS releases. Berkeley UPC needs a review. Be the first to review this app and get the discussion started! The language provides a uniform programming model for both shared and distributed memory hardware. The programmer is presented with a single shared, partitioned address space, where variables may be directly read and written by any processor, but each variable is physically associated with a single processor. UPC uses a Single Program Multiple Data (SPMD) model of computation in which the amount of parallelism is fixed at program start-up time, typically with a single thread of execution per processor. UPC combines the programmability advantages of the shared memory programming paradigm and the control over data layout and performance of the message passing programming paradigm. Berkeley UPC is a high-performance, portable and fully open-source implementation of the UPC language designed for large-scale multiprocessors, PC clusters, and clusters of shared memory multiprocessors. 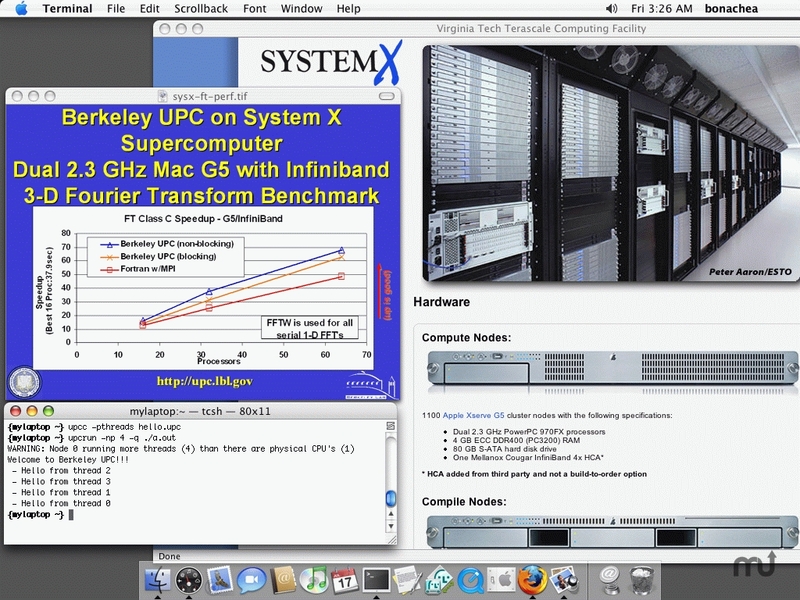 Berkeley UPC is the first UPC implementation available for Mac OS X, and delivers competetive performance for supercomputing applications on the largest OS X clusters in the world, yet also provides support for UPC code development on Mac OS X laptops and desktop workstations.